According to a report from Toronto Real Estate Board released today, condo prices in 416 area are down by 4.4% compared to the same time last year. The sales volume dipped by 4.2%. 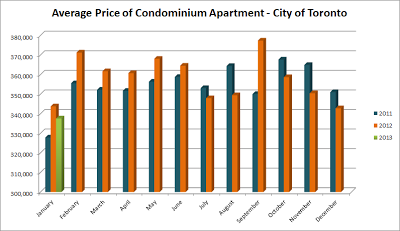 The average price of a condo apartment in city of Toronto was $337,624. That's almost $40,000 less than an all time high price of $377,422 reached last September. All in all, this continues the 2012 trend in declining prices on a year-to-year basis. Below is the updated graph including this most recent data.